The “Demon in a Bottle” storyline is arguably the seminal plot arc of the Iron Man comics and Tony Stark’s character. So naturally after two highly successful movies in the franchise, when a third was announced, fans wondered if we were finally going to get a film that dealt with Stark’s bout with alcoholism. There have been clues and character set ups that would make a progression to an alcoholic Stark by Iron Man 3 make sense: we’ve seen him reach unapologetically (and often) for the whiskey; he’s got control issues and a problem with hubris (can’t really blame the man, seeing as how he’s a genius); and his near-death experience in The Avengers as the result of traversing across space through a wormhole to save New York City from a nuclear missile (after narrowly escaping paladium poisoning in Iron Man 2 and almost being killed as part of the mother of all corporate take-over plots by his father-figure, Obadiah Stane, in Iron Man) makes for one hell of an emotional trigger. I think we were just told by the studio that we should probably paint Tony Stark as being kind of an industrialist and a crazy guy, or even a bad guy at some points, but the Demon in a Bottle stuff of him being an alcoholic wouldn’t really fly. I don’t blame that. I’m not surprised at all that Disney took one look at Tony Stark the alcoholic and said “Thanks but no thanks.” The plot line is too dark, too complex and too adult for the audience that the studio is trying to appeal to: the all-important family demographic (let’s leave aside for a moment that it’s still going to be filled with explosions, what’s essentially a terrorist plot and violence galore because apparently that’s not a problem for Disney or the mommy blogs). Tony Stark. Genius. Billionaire. Hero. Alcoholic? This is a prime example of that complicated relationship between pop culture/mainstream culture and nerd/geek culture that keeps rearing its chimeric head. The power and reach of Disney backing Iron Man 3 offers the opportunity for the film to access a bigger budget and more importantly, the resources of the formidable Mouse Marketing Machine. The trade-off is that Disney likes to play things safe, which means not risking alienating that all-important family-friendly demographic by using potentially problematic plot lines like “Demon in a Bottle.” Iron Man fans who’ve known the character long before the movies might flock to see an Iron Man 3 centered around Stark’s battle with alcoholism, but parents aren’t going to be as eager to take their kids to see Tony Stark, hero, billionaire philanthropist – and raging alcoholic. The elements that fans love about the “Demon in the Bottle” story – Stark’s long fall to rock bottom, his struggle to recovery and being haunted by the ghosts of his failures – have arguably been dealt with in the Iron Man films without the need to tack on alcoholism to Stark’s list of faults. We’ve seen him push his friends and loved ones aside with his hubris while he battles his inner demons and self-doubt, no recourse to booze necessary. 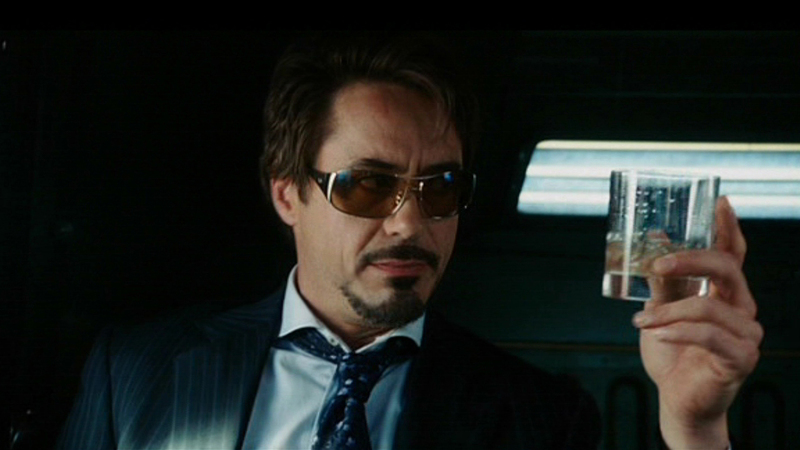 Robert Downey, Jr., has managed to play Stark as an alcoholic without actually making Stark an alcoholic. Stark’s an addict all right – it’s just that instead of being addicted to alcohol, he’s addicted to his own cult of personality. Would “Demon in a Bottle” make for a good movie plot? Absolutely yes. Is it necessary for the portrayal of Stark that the previous films have given us? Not really. So while I’m disappointed that we’re not going to get to see Stark battle the bottle, I understand why and I’m not particularly surprised. But I’m still disappointed in the predictability of a big, established movie studio choosing to go the bland and safe route even though a plot line, while risky, could have paid off in huge dividends (at least in terms of character development and a rewarding story arc). I guess Disney’s ignoring the fact that the “Demon in a Bottle” plot arc is 34 years old (it’s younger than me??) and Iron Man has survived as a rather lucrative franchise quite well. Disney bought Marvel and is backing the film after all, isn’t it? Now – about that rumor going around that Pepper Potts might actually don a suit of her own before the end of the movie? I would LOVE to be surprised (pleasantly) to find that rumor turns out to be true. Iron Man 3 premieres in U.S. theaters at midnight, May 3. This entry was posted in TV/Film and tagged alcoholism, Demon in a Bottle, Disney, Iron Man 3, pop culture, Tony Stark by Michi Trota. Bookmark the permalink.